Available analysis types include: Section properties calculations (with regard to a user defined base material or the geometric properties of the section) including inertia data, elastic and plastic elasticity moduli, etc. Calculation and plotting of the Moment vs. Curvature diagram for bending about a predefined axis. Accordingly, a Force vs. Axial strain diagram can be created. Calculation of the equivalent bilinear Moment vs. Curvature graph with predefined or no hardening, as well as reporting of yield/ultimate curvatures and moments. Estimation of the neutral axis, strain distribution and plotting of stress contour under given sets of biaxial applied forces. 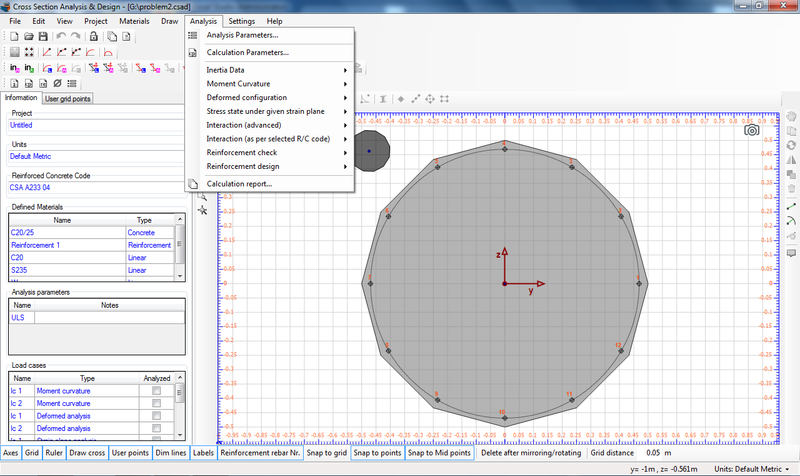 Reporting of reinforcement forces (if any) and the maximum/minimum stress locations for each material in the section. Estimation of the biaxial applied forces under a given neutral axis (location, orientation and curvature). As in previous case, the strain distribution and a stress contour are plotted. Moreover, the reinforcement forces (if any) are reported and the maximum/minimum stress locations for each material in the section are computed. Advanced Interaction Diagram Analysis. 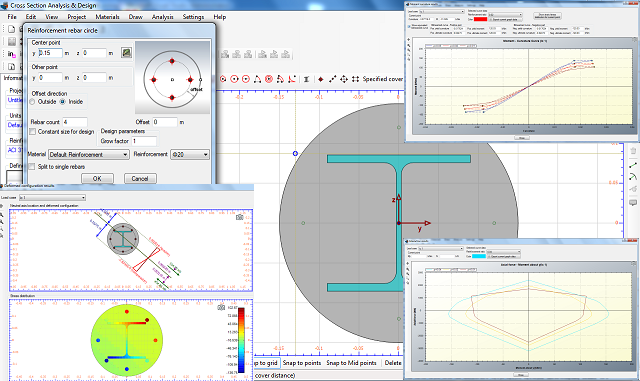 The failure surface is calculated and plotted in one of the following coordinate systems, as per user defined parameters: Moment about predefined axis vs. Axial force or Moment about first axis vs. Moment about second axis. The user can specify different values for reinforcement ratios (if rebars have been provided) or axial force values, so that a multiple graphs can be plotted in one graph. This analysis type is generic and can be used to excerpt the interaction diagram of any generic section under of any material, shape etc. Apart from this, the use of Advanced Interaction Analysis is not recommended for reinforced concrete cross sections, where the following option is more appropriate. Interaction diagram as per specified Reinforced Concrete Code. The program computes the interaction diagram as explained before, but applies all relative regulation checks, stress distributions, safety factors etc., according to the provided code (AASHTO, UBC, AS 3600, IS 456, ACI 318, BS 8110, CSA A233, EC2, NZS 3101 and CP 65). Reinforcement Design. The provided reinforcement is designed, so that the required rebar diameters are chosen from the existing reinforcement rebars defined in the project. This procedure takes place in accordance to the provided regulation (AASHTO, UBC, AS 3600, IS 456, ACI 318, BS 8110, CSA A233, EC2, NZS 3101 and CP 65). Reinforcement Check. The given reinforcement pattern is checked and a capacity ratio of the cross section is reported.